The CFA accepts the Bombay cat in only one color, jet black. A medium- long, muscular and sinuous body, combined with graceful movements are typical of this breed and are enhanced by the all black coloration, which includes nose leather, whiskers and paw pads. Bombay cats require very little grooming. Just petting is usually enough to keep the coat shiny and free of dead hair. A rubber brush or slicker brush, gently employed can be used for excessive or seasonal shedding. Be sure to feed a nutritionally complete food, as this will add gloss to the shiny black coat. Smart and personable, these are happy lap cats who actively seek out the companionship of their humans. Nicknamed "The Supervisor", a Bombay will thoroughly inspect everything new brought into the home. Always happy to give head bonks and notorious for claiming everything in sight as theirs, they love nothing more than to be held and stroked. Many Bombays are very talkative and will carry on a conversation with their humans, much like a Siamese. Easily trained, this cat is best in a home where he can get lots of love and attention. Bombay got its name from its original breeder, the late Nikki Horner, from Louisville, Kentucky, who set out to create a completely domestic cat who would have the appearance of the beautiful black Bombay Tiger of India. Also known as a Black Burmese, this breed was created by careful crosses with a sable Burmese and a black American Shorthair. 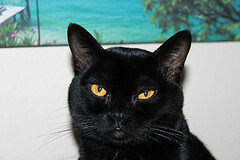 The Bombay has large, gold or copper eyes and a rounded head, crowned by lovely wide set ears. Close lying and satiny, the ideal coat will have a high sheen like patent leather or satin. Occasionally kittens will be sable, not black, but the graceful shape and personality will still be there. This is an active breed, and a willing accomplice to anything his humans do. Always interested in his surroundings, he is a creature of habit, and likes when he knows where everyone is, and what they're doing. Good with other pets and respectful kids, the Bombay is a lithe and graceful jumper who will investigate his home thoroughly, so cat proofing is a must. Bombay cats love cat trees, the higher the better. Having a high perch is one of their great joys in life. A Cat Lady personal note: If this profile sounds biased, that's because it is. I freely admit that my only son and the light of my life is my Spooky, who just happens to be a Bombay cat. I am lucky enough to have been blessed with this amazing companion and familiar, and can personally attest to the winning personality and sweet nature of this breed. 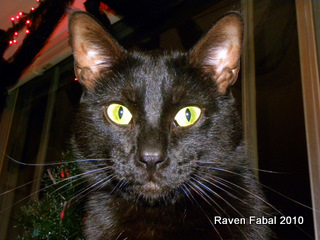 Entertaining and inventive, this "mini-panther" enjoys showing off for us humans, and will often be intentionally cute just to get attention. So, I am a bit prejudiced in favor of the Bombay cat, and highly recommend them to anyone wanting a loyal and lovable companion like my Spooky.